Jet Studio is located in Brussels, right in the heart of Europe. 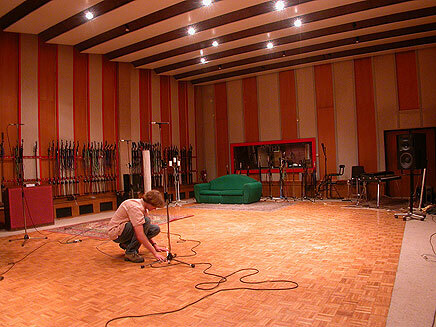 Founded by DECCA RECORDS in 1942, it is the oldest studio in Belgium and one of the oldest studios in Europe. Jet has hosted international artists such as Edith Piaf, Shirley Bassey, Barbara Streisand, Alain Delon, Caterina Valente, Gilbert Becaud and recently Manic Street Preachers and the American rockband Live. Maybe it was an amazing acoustic vision, or just plain luck. Fact is that the acoustics of the live-area made Jet legendary. The 135 square metres, 7 m high room with two isolation booths represents a very comfortable space to record a whole band. Today it is favoured particulary by jazz musicians. Down the stairs at the end of the live room is a dark and humid space that smells like an old cave. By the candle light you can see a speaker and two microphones: this is the echo chamber of Jet Studio. The engineer told us that he sometimes, during a session, opens the doors to their nice looking lobby and places a microphone there to record some extra ambience. This feature has been included in the set of course. These two iso booths make the set complete.